"This is the end of an amazing life.” So said Neil Bush when his father, President George H. W. Bush, passed away Friday night at his home in Houston. Mr. Bush had been dealing with numerous health issues over recent years. In his last hours, he was asked if he wanted to go to the hospital. He declined, saying that he was ready to go and be with Barbara, his wife of seventy-three years, and their late daughter Robin, who died of leukemia in 1953 at the age of three. Mr. Bush had rallied Friday morning but declined quickly that evening. His children around the country were notified. George W. Bush called from Dallas, telling him he had been a “wonderful dad” and that he loved him. The New York Times reports that they were his last words. I disagree. George Herbert Walker Bush was the last US president to have served in combat. He and his wife hold the record for the longest marriage in presidential history. He enlisted in the armed forces on his eighteenth birthday. The youngest pilot in the Navy when he got his wings, he flew fifty-eight combat missions during the Second World War. On one mission over the Pacific, he was shot down and rescued by a US submarine. After a successful career in the oil industry, he turned to public service. He was elected to two terms in the House of Representatives, then served as Ambassador to the United Nations, Chairman of the Republican National Committee, Chief of the US Liaison office in the People’s Republic of China, Director of the Central Intelligence Agency, vice president, and president. As president, he helped navigate the end of the Cold War, supported Germany’s reunification, and signed into law the Americans with Disabilities Act. Under his command, US forces liberated Kuwait and blocked the aggression of Saddam Hussein. 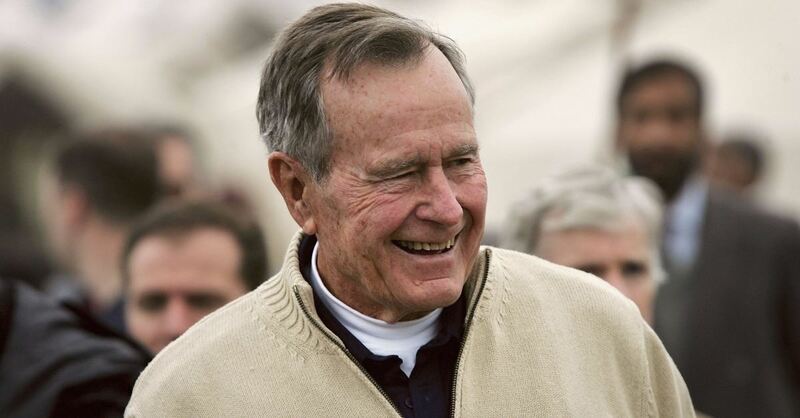 Since his passing, however, President Bush has been remembered most for his personal character. Two commitments explain Mr. Bush’s legacy: his desire to live with integrity, and his love for the One whose Spirit produces such “goodness,” “faithfulness,” and “self-control” in his followers (Galatians 5:22-23). Consider his passion for integrity. I experienced Mr. Bush’s commitment to humility and service when visiting his presidential library at College Station, Texas. My wife and I have visited many such libraries around the country. Understandably, most are primarily a tribute to the person and his presidency. Mr. Bush’s library is a tribute to the values for which he lived and was willing to die and to the country he loved and served. A life of such character does not end when its days on earth are over. The Bible says of the righteous Abel, “Through his faith, though he died, he still speaks” (Hebrews 11:4). Now you and I have a choice. We can pause to remember the life of George H. W. Bush and then move on with our own lives. Or we can learn from his legacy and resolve to emulate his life of character and commitment to Jesus. If we make the latter choice, our lives will speak on earth long after we are in heaven. What if it were today for you?